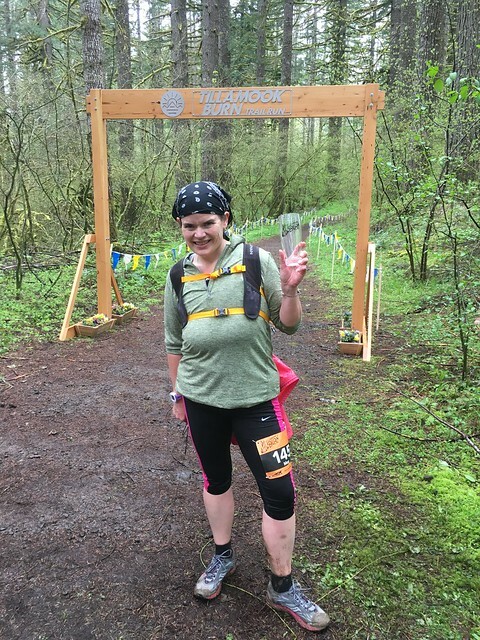 Its been less than 24 hours since I completed the Tillamook Burn 50K, my very first ultra. So my brain is back to normal while the feet and legs are demanding horizontal comfort as repayment for everything I put them through yesterday. I promised them no running for a week if they got me to the finish line on time. Race Prep: I started thinking and talking about an ultra marathon two years ago, after completing my eighth marathon. It seemed like this amazing and ultimate runner’s bucket list item. A few of my goals in searching for a race included that it be in spring 2018 (after I completed my graduate studies) and I wanted somewhere beautiful in the Pacific Northwest (my home of the past 11 years). Then in Fall 2017, I found Tillamook Burn 50K. The race was perfect. Close enough to not need a hotel. Beautiful pictures online. 31-point-something-something miles so only five miles more than a marathon (poor, naive Meg). 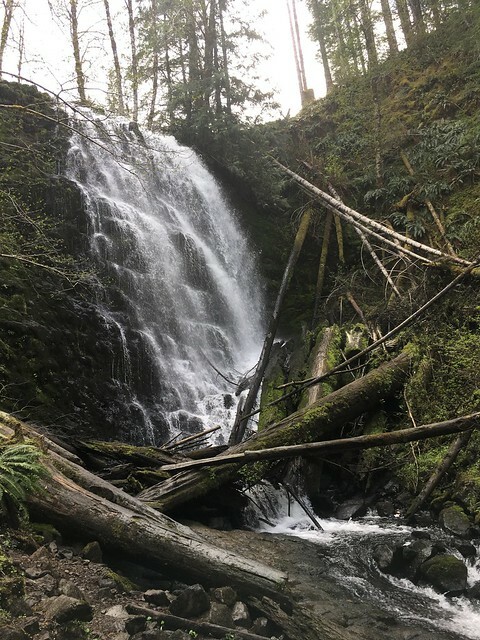 And set in a forest that had recovered from a fire years before (which was lovely poetry as the Eagle Creek Fire was scaring so many about how our beautiful Columbia Gorge would ever recover). I woke up in the middle of the night to ensure I’d get into this perfect race. Turned out the race filled up within a few months, rather than a few hours, but better to get my place early. Using a training plan I found online, I spent four months preparing for this race. I was running with friends or solo five days a week, including long runs on Saturday and Sunday. And I walked many evenings to get in some extra easy-miles. I like to call this part of the training “What Meg did right.” As I learned yesterday, the chapter on “What Meg did wrong” includes not training enough on hills or stairs, and not training enough in the actual trail shoes I would be running in. 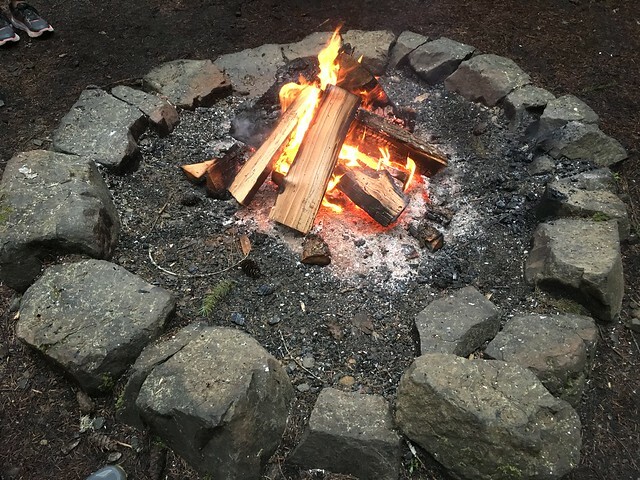 Race Day Morning: The Tillamook Burn 50K was on Saturday, April 28th. Some of the runners on the course were back the next morning for the 20 miler that used some of the same course. The staging area for the event was great. Plenty of nearby parking and a good number of volunteers to get us pointed in the right directions. I arrived about 6:30am for the 8am start time, with plenty of time to spare for getting my bib, shirt, some coffee, and the free oatmeal samples. There was a large covered area with benches to wait in, plus a lovely bonfire to stand around (next time I’m bringing smores supplies!). Runners chatted around the fire about their expectations for the race, past experiences with ultras, and comments on the weather. One runner mentioned that the thunderstorms predicted at 2pm would help everyone run fast. I was not quite as comforted as he was by this expectation. I finally found some folks like me who were more concerned about beating the cut-off times than their running plans for the rest of the weekend (I’m serious; there was a runner talking about doing the Eugene Marathon the next day. Woah and wow!). As race time drew closer, the runners filled in more around the fire and covered area, and got quieter. We all had a hard day ahead and needed our own ways to prepare. It seemed like no time had passed before an announcer was giving shout outs to all of the volunteers and contributors to the race, reminding us of the cut-off times, and wishing us a great run. Then with the buzz of a horn, we were off. The Race: It was a sweet start to the race when spectators tell you five seconds in that you are looking great. Now if only that stayed true for the next 50K. Tillamook Burn 50K is an out-and-back course using open trails, so there were a few bikers, runners, and hikers along the trail with us. It was mostly single-lane trails. After a crowded start, runners spread out quickly and there were points when I could not see anyone on the course ahead or behind me. Thank goodness for the orange with polka-dot tags along the course that confirmed I was going the right way. Those little things always popped up just when I worried I was lost. I wish there had also been some mile markers along the course too as it was tough to gauge how close or how far I was from aid stations. “Just around the river bend” from Pocahontas was stuck in my head for about an hour as I kept hoping that I was close to the final aid station. I have to give a major shout out here to the volunteers at the aid stations. There were three stations on the course, with runners passing through two of them on the way out and back. The first was after about 3 miles of mostly uphill climbing. That first stretch was the biggest incline of the course, and knowing there would be snacks at the top helped me keep moving. The group at this station (and really every station) was amazing. They offered to fill water bottles, and had so many snacks available: PB&J sandwiches, goldfish crackers, M&Ms, pickles, chips, bananas, and more. The volunteers at every station were so encouraging and cheerful. When I shared with folks at one station how worried I was that I would not make the cut off, a woman in an adorable rainbow hat promised to get me what I needed and get me going to try my best. You all were just ah-mazing. The course was beautiful the entire day. There were steep inclines and declines that started and then ended the race, with lots of ups and downs in between. The course went through about eight ankle-deep streams and across four or five dirt roads, but otherwise trees surrounded you. Sounds of the woods filled in where normally my street running means cars, radios, and sirens. And once I decided that those scurrying sounds were bunnies and not snakes, lizards, or bears, I felt at peace (don’t be ruining my bunny theory). Finish Line: If you remember earlier in this post, I mentioned that there was a chapter in training regarding “What Meg did wrong.” I’m sharing this part of the story so that you can be wiser than me. To paraphrase a former co-worker: Learn from Your Meg. My training for this race had me prepared for the distance, but absolutely not for the elevation changes. I did not respect when the website said to anticipate about 7,000 feet of elevation ascent and 7,000 feet of elevation descent. All of that meant a lot more walking during this event than I planned, but I am proud to say that I did keep moving throughout the race and managed to cross the finish line at exactly 5pm (aka 9 hours after the start, aka the cut off time for finishing). With my finisher’s pint glass in hand, I slowly walked over to the covered benches and sat down for the first time in over nine hours. Three other runners came in before the sweepers and were allowed to have their glasses as well. I’m not sure what our official website records will say, but I know that each of us completed a 50K on Saturday morning and are freaking thrilled. After the finish line, I was congratulated by at least a dozen strangers, including volunteers from the course (like the rainbow hat woman) and other runners. They were all genuinely proud of what I, and these other runners, had accomplished. It was so amazing to feel accepted as one of them, even if it had taken me an hour or more than most of them. I was an ultra marathoner. The Day After the Race: The question I have of course been asked by friends since yesterday is if I will ever run an ultra again. My answer is not any time soon. Throughout the event, I was stressed about beating the cutoff times because it would mean being pulled out of the race. A favorite running phrase of mine is “DFL is better than DNF is better than DNS.” I had started and desperately wanted to finish. I could handle the physical pain of another ultra marathon, but not the stress of one…yet. So instead I just signed up for a 6-mile trail run in September and have a road marathon in Columbia Gorge this fall to train for. When I am ready, then absolutely I would love to try the Tillamook Burn 50K again. The course is great, the volunteers are greater, and the challenge is waiting for anyone to take on.